"Dormition of the Virgin" redirects here. For the El Greco painting of the same name, see Dormition of the Virgin (El Greco). The Dormition of the Mother of God (Greek: Κοίμησις Θεοτόκου, Koímēsis Theotokou often anglicized as Kimisis; Bulgarian: Успение на Пресвета Богородица, "Uspenie na Presveta Bogoroditsa", Russian: Успение Пресвятыя Богородицы, Uspenie Presvetia Bogoroditsi; Georgian: მიძინება ყოვლადწმიდისა ღვთისმშობელისა), Albanian: Fjetja e Shën Marisë, is a Great Feast of the Eastern Orthodox, Oriental Orthodox and Eastern Catholic Churches which commemorates the "falling asleep" or death of Mary the Theotokos ("Mother of God", literally translated as God-bearer), and her bodily resurrection before being taken up into heaven. It is celebrated on 15 August (28 August N.S. for those following the Julian Calendar) as the Feast of the Dormition of the Mother of God. The Armenian Apostolic Church celebrates the Dormition not on a fixed date, but on the Sunday nearest 15 August. The death or Dormition of Mary is not recorded in the Christian canonical scriptures. Hippolytus of Thebes, a 7th- or 8th-century author, claims in his partially preserved chronology to the New Testament that Mary lived for 11 years after the death of Jesus, dying in AD 41. The term Dormition expresses the belief that the Virgin died without suffering, in a state of spiritual peace. This belief does not rest on any scriptural basis, but is affirmed by Orthodox Christian Holy Tradition. It is testified to in some old Apocryphal writings, but neither the Orthodox Church nor other Christians regard these as possessing scriptural authority. The Feast of the Dormition is preceded by a two-week fast, referred to as the Dormition Fast. From August 1 to August 14 (inclusive) Orthodox and Eastern Catholics fast from red meat, poultry, meat products, dairy products (eggs and milk products), fish, oil, and wine. The Dormition Fast is a stricter fast than either the Nativity Fast (Advent) or the Apostles' Fast, with only wine and oil (but no fish) allowed on weekends. As with the other Fasts of the Church year, there is a Great Feast that falls during the Fast; in this case, the Transfiguration (August 6), on which fish, wine and oil are allowed. In some places, the services on weekdays during the Fast are similar to the services during Great Lent (with some variations). Many churches and monasteries in the Russian tradition perform the lenten services on at least the first day of the Dormition Fast. In the Greek tradition, during the Fast either the Great Paraklesis (Supplicatory Canon) or the Small Paraklesis is celebrated every evening except Saturday evening and the Eves of the Transfiguration and the Dormition. The first day of the Dormition Fast is a feast day called the Procession of the Cross (August 1), on which day it is customary to have an outdoor procession and perform the Lesser Blessing of Water. In Eastern Orthodoxy it is also the day of the Holy Seven Maccabees, Martyrs Abimus, Antonius, Gurias, Eleazar, Eusebonus, Alimus, and Marcellus, their mother Solomonia, and their teacher Eleazar. Therefore, the day is sometimes referred to as "Makovei". Finally it is also considered the First of the three "Feasts of the Saviour" in August, the Feast to the All-Merciful Saviour and the Most Holy Mother of God. In Orthodoxy and Catholicism, in the language of the scripture, death is often called a "sleeping" or "falling asleep" (Greek κοίμησις; whence κοιμητήριον > coemetērium > cemetery, "a place of sleeping"). A prominent example of this is the name of this feast; another is the Dormition of Anna, Mary's mother. The Dormition tradition is associated with various places, most notably with Jerusalem, which contains Mary's Tomb and the Basilica of the Dormition, and Ephesus, which contains the House of the Virgin Mary, and also with Constantinople where the Cincture of the Theotokos was enshrined from the 5th through 14th centuries. The first four Christian centuries are silent regarding the end of the Virgin Mary's life, though it is asserted, without surviving documentation, that the feast of the Dormition was being observed in Jerusalem shortly after the Council of Ephesus. Up until the 5th century Church Fathers do not mention the death of the Virgin, and before the 4th-5th century Dormition was not celebrated among the Christians as a holy day. If any think [I] am mistaken, moreover, let them search through the scriptures any neither find Mary's death, nor whether or not she died, nor whether or not she was buried—even though John surely travelled throughout Asia. And yet, nowhere does he say that he took the holy Virgin with him. Scripture simply kept silence because of the overwhelming wonder, not to throw men's minds into consternation. For I dare not say—though I have my suspicions, I keep silent. Perhaps, just as her death is not to be found, so I may have found some traces of the holy and blessed Virgin. ...The holy virgin may have died and been buried—her falling asleep was with honour, her death in purity, her crown in virginity. Or she may have been put to death—as the scripture says, 'And a sword shall pierce through her soul'—her fame is among the martyrs and her holy body, by which light rose on the world, [rests] amid blessings. Or she may have remained alive, for God is not incapable of doing whatever he wills. No one knows her end. But we must not honour the saints to excess; we must honour their Master. It is time for the error of those who have gone astray to cease. Neither the letter of Scripture nor Tradition does not teach us that Mary had left this life as a consequence of suffering from bodily ulcers. The earliest Dormition traditions surface in manuscripts at some point in the late 5th century, when three distinct narrative traditions describing the end of Mary's life suddenly appear. Stephen Shoemaker characterised them as the "Palm of the Tree of Life" narratives, the "Bethlehem" narratives, and the "Coptic" narratives—aside from a handful of atypical narratives. The events of the Dormition of the Virgin and her burial are dealt with in several known apocrypha: "Tale of the Dormition of the Virgin" by Pseudo-John the Theologian (emerged in the mid-5th century or later), "De transitu Virginis Mariae" by Pseudo-Melito of Sardis (5th century), the composition of Pseudo-Dionysius the Areopagite, "According to John, Archbishop of Thessalonica." One of these apocrypha is placed in the "History of the Church" by Nikephoros Kallistos Xanthopoulos. All listed apocrypha are quite late—5th and 6th century—and their content differs from each other. Therefore, the Church did not adopt all their content, but only the basic idea that the Virgin Mary blissfully rested and Her soul was adopted by her Son Jesus Christ at Dormition. According to Nikephoros Kallistos Xanthopoulos in his "History of the Church," Emperor Maurice (582–602) issued an edict which set the date for the celebration of the Dormition on August 15. After that Christians in the empire began to celebrate the death of the Virgin Mary. Modestus, Patriarch of Jerusalem (630—632) said at this celebration, while preaching, that he regrets the lack of specific information about the death of the Virgin Mary. In Rome the feast called Dormitio Beatae Virginis was established by Pope Sergius I (687–701), borrowed from Constantinople. According to later Catholic tradition, Mary, having spent her life after Pentecost supporting and serving the nascent Church, was living in the house of the Apostle John, in Jerusalem, when the Archangel Gabriel revealed to her that her death would occur three days later. The apostles, scattered throughout the world, are said to have been miraculously transported to be at her side when she died. The sole exception was Thomas, who was preaching in India. He is said to have arrived in a cloud above her tomb exactly three days after her death, and to have seen her body leaving to heaven. He asked her "Where are you going, O Holy One? ", at which she took off her girdle and gave it to him saying "Receive this my friend", after which she disappeared. Thomas was taken to his fellow apostles, whom he asked to see her grave, so that he could bid her goodbye. Mary had been buried in Gethsemane, according to her request. When they arrived at the grave, her body was gone, leaving a sweet fragrance. An apparition is said to have confirmed that Christ had taken her body to heaven after three days to be reunited with her soul. Orthodox theology teaches that the Theotokos has already undergone the bodily resurrection, which all will experience at the second coming, and stands in heaven in that glorified state which the other righteous ones will only enjoy after the Last Judgment. The Dormition of the Theotokos is celebrated on August 15 (August 28, N.S. for those following the Julian Calendar), the same calendar day as the Roman Catholic Feast of the Assumption of Mary. The Dormition and the Assumption are the different names respectively in use by the Eastern and Catholic traditions for the end of Mary's life and departure from the earth, although the beliefs are not necessarily identical. The Orthodox Church specifically holds one of the two Roman Catholic alternative beliefs, teaching that Mary died a natural death, like any human being; that her soul was received by Christ upon death; and that her body was resurrected on the third day after her repose, at which time she was taken up, bodily only, into heaven when the apostles, miraculously transported from the ends of the earth, found her tomb to be empty. The specific belief of the Orthodox is expressed in their liturgical texts used at the feast of the Dormition. The Catholic doctrine of the Assumption covers Mary's bodily movement to heaven, but the dogmatic definition avoids saying whether she was dead or alive at that point. The question had been in dispute in Catholic theology, and although she is normally shown in Catholic art as alive at the point of assumption, many Catholics believe she had died in the normal way. Pope Pius XII alludes to the fact of her death at least five times, but left open the question of whether or not Mary actually underwent death in connection with her departure, in his Apostolic constitution, Munificentissimus Deus (1950), which dogmatically defined ex cathedra (i.e., infallibly) the Assumption. It is true that in Revelation death is presented as a punishment for sin. However, the fact that the Church proclaims Mary free from original sin by a unique divine privilege does not lead to the conclusion that she also received physical immortality. The Mother is not superior to the Son who underwent death, giving it a new meaning and changing it into a means of salvation. Involved in Christ’s redemptive work and associated in his saving sacrifice, Mary was able to share in his suffering and death for the sake of humanity’s Redemption. What Severus of Antioch says about Christ also applies to her: “Without a preliminary death, how could the Resurrection have taken place?” (Antijulianistica, Beirut 1931, 194f.). To share in Christ’s Resurrection, Mary had first to share in his death. The New Testament provides no information on the circumstances of Mary’s death. This silence leads one to suppose that it happened naturally, with no detail particularly worthy of mention. If this were not the case, how could the information about it have remained hidden from her contemporaries and not have been passed down to us in some way? As to the cause of Mary’s death, the opinions that wish to exclude her from death by natural causes seem groundless. It is more important to look for the Blessed Virgin’s spiritual attitude at the moment of her departure from this world. In this regard, St Francis de Sales maintains that Mary’s death was due to a transport of love. He speaks of a dying “in love, from love and through love”, going so far as to say that the Mother of God died of love for her Son Jesus (Treatise on the Love of God, bk. 7, ch. XIII–XIV). Whatever from the physical point of view was the organic, biological cause of the end of her bodily life, it can be said that for Mary the passage from this life to the next was the full development of grace in glory, so that no death can ever be so fittingly described as a “dormition” as hers." Both views agree that she was taken up into heaven bodily. The Eastern Catholic observance of the feast corresponds to that of their Orthodox counterparts, whether Eastern Orthodox or Oriental Orthodox. Malankara orthodox church which is an oriental orthodox church celebrated feast of dormition on August 15 with great importance as that day is the national independence day of India. It is customary[why?] in many places[where?] to bless fragrant herbage[which?] on the Feast of the Dormition. In some places,[where?] the Rite of the "Burial of the Theotokos" is celebrated at the Dormition, during the All-Night Vigil. The order of the service is based on the service of the Burial of Christ on Great Saturday. An Epitaphios of the Theotokos, a richly embroidered cloth icon portraying her lying in state is used, together with specially composed hymns of lamentation which are sung with Psalm 118. Special Evlogitaria for the Dormition are chanted, echoing the Evlogitaria of the Resurrection chanted at matins on Sundays throughout the year as well as on Lazarus Saturday and Great Saturday. This Epitaphios is placed on a bier and carried in procession as is the Epitaphios of Christ on during Great Saturday. This practice began in Jerusalem, and from there it was carried to Russia, where it was followed in various Dormition Cathedrals, in particular that of Moscow. The practice slowly spread among the Russian Orthodox, though it is not by any means a standard service in all parishes, or even most cathedrals or monasteries. In Jerusalem, the service is chanted during the Vigil of the Dormition. In some Russian churches and monasteries, it is served on the third day after Dormition. The Feast of the Dormition has a one-day Forefeast and 8 days of Afterfeast. The feast is framed and accentuated by three feasts in honour of Jesus Christ, known as the "Three Feasts of the Saviour in August". These are: the Procession of the Cross (August 1), the Transfiguration (August 6), and the Icon of Christ "Not Made by Hand" (August 16). The Maronite Church has a tradition that their Third Anaphora of the Apostle Peter or Sharrar (the Maronite redaction of the Holy Qurbana of Addai and Mari) was originally composed for and used at the funeral of the Theotokos. This tradition probably developed because in its final form the anaphora has twelve paragraphs, i.e., one for each concelebrating apostle present at the funeral mass of the Theotokos. One might notice the similarities between the traditional depictions of the Dormition of the Theotokos in Byzantine iconography and the account of the death of the Egyptian Desert Father, Sisoes the Great. In both Christ is seen coming to receive the soul of the dying saint surrounded by an aureola or cloud of blinding light and accompanied by the angels and prophets. In Byzantine iconography the other Christs shown surrounded by such a cloud of light are those also seen in icons of the Transfiguration, the Resurrection and the Last Judgment. One might further note that in some icons of the Dormition the Theotokos is depicted at the top of the icon in a similar aureola before the opening gates of heaven. This suggests that contemporary accounts of the deaths of the Desert Fathers accompanied by sudden burst of light came to influence the development of the iconography of the Dormition. The Dormition is known as the Death of the Virgin in Catholic art, where it is a reasonably common subject, mostly drawing on Byzantine models, until the end of the Middle Ages. The Death of the Virgin by Caravaggio, of 1606, is probably the last famous Western painting of the subject. The Dormition: ivory plaque, late 10th to early 11th century (Musée de Cluny). 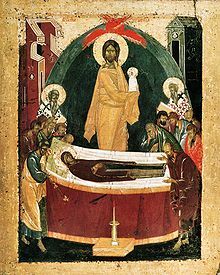 12th-century rendition of the Dormition by a Novgorod artist. Uspenje presvete Bogorodice, 40-square-metre fresco from 1265, Sopoćani Monastery, Serbia. Koimesis Mosaic at the Chora Church, Constantinople. Modern icon of the Dormition of the Theotokos. Procession of the Epitaphios of the Theotokos, Toronto. Assumption Cathedral – many cathedrals, especially in Russia, are dedicated to this feast. ^ Rainer Riesner. Paul's early period: chronology, mission strategy, theology. p. 120. Retrieved August 20, 2011. .
^ Outside the Dormition Fast it is always the Small Supplicatory Canon (Paraklesis) which is chanted. During the Dormition Fast, however, the Typikon prescribes that the Small and Great Supplicatory Canons be chanted on alternate evenings: If August 1st falls on a Monday through Friday, the cycle begins with the Small Supplicatory Canon; if August 1st falls on a Saturday or Sunday, the cycle begins with the Great Supplicatory Canon. ^ A fairly representative example of mainstream Orthodox teaching is offered by Sophia Fotopoulou: "We have no historical data to indicate how long the Mother of God remained on earth after the ascension of Christ into heaven, nor when, where, or how she died, for the Gospels say nothing of this. 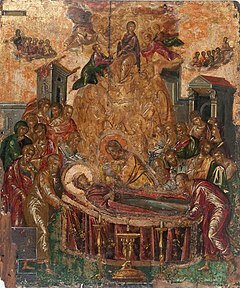 The foundation for the feast of the Dormition is to be found in a sacred tradition of the Church dating from apostolic times, apocryphal writings, the constant faith of the People of God, and the unanimous opinion of the holy Fathers and Doctors of the Church of the first thousand years of Christianity." "The Dormition of the Theotokos". ^ "М. Поснов. История Христианской Церкви". Archived from the original on 2018-07-16. Retrieved 2018-12-28. ^ Roberts, Alexander; Donaldson, James; Coxe, A. Cleveland; Knight, Kevin, eds. (1886). Ante-Nicene Fathers, Vol. 8. Translated by Walker, Alexander. Buffalo, NY: Christian Literature Publishing Co. Retrieved 27 January 2019. ^ "Dormition (Keemeesis) of the Theotokos". The Life of the Virgin Mary, The Theotokos. Holy Apostles Convent and Dormition Skete. Archived from the original on 17 May 2011. Retrieved 6 May 2011. ^ "General Audience - 25 June 1997, sections 3 and 4". Vatican.va. 1997-06-25. Retrieved 2013-11-03. Shoemaker, Stephen J. Ancient Traditions of the Virgin Mary's Dormition and Assumption. Oxford; New York: Oxford University Press. ISBN 978-0-19-925075-2. OCLC 50101584. Wikimedia Commons has media related to Dormition of Virgin Mary.